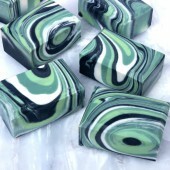 This soap is made with goat milk for an extra creamy feeling on the skin. MILK PREP: When lye is added to milk, it heats up to around 200 ° F. This scorches the milk, causing discoloration and an unpleasant odor. To prevent scorching, it's important keep temperatures as cool as possible. 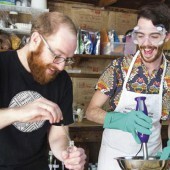 Our preferred technique is to freeze the goat milk and add the sodium hydroxide lye flakes directly to the frozen milk. To keep the milk extra, extra cold, you can place the container into a larger container with ice. In this project we skipped this step, but it's a personal preference. Measure out 11.6 ounces of goat milk and pour it into ice cube trays (in this case we used Medium 9 Ball Silicone Molds). Allow the milk to fully freeze. 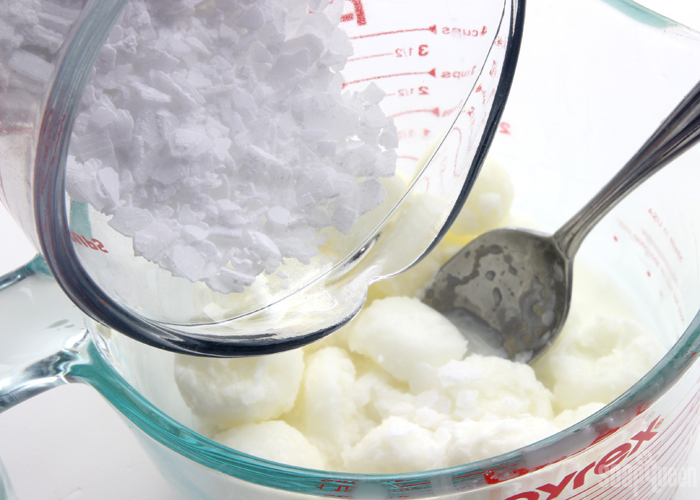 Then, place a container appropriate for mixing lye on a scale and weigh out the frozen cubes. Although it was measured previously, some milk might be lost in the freezing/transferring process. If you're missing any, pour cold goat milk into the container until you have 11.6 ounces. You can also use cold distilled water. LYE PREP: With safety gear on, slowly add about ¼ of the lye flakes directly to the frozen goat milk. Use a stainless steel spoon to stir the lye flakes and goat milk together. Slowly, the flakes will begin to melt the goat milk cubes. After a few minutes of stirring, add another ¼ of the flakes and continue stirring for several minutes. Continue this process until all the lye flakes have been added to the goat milk. Continue stirring and stirring...and stirring! The goat milk will continue to melt as more lye is added. 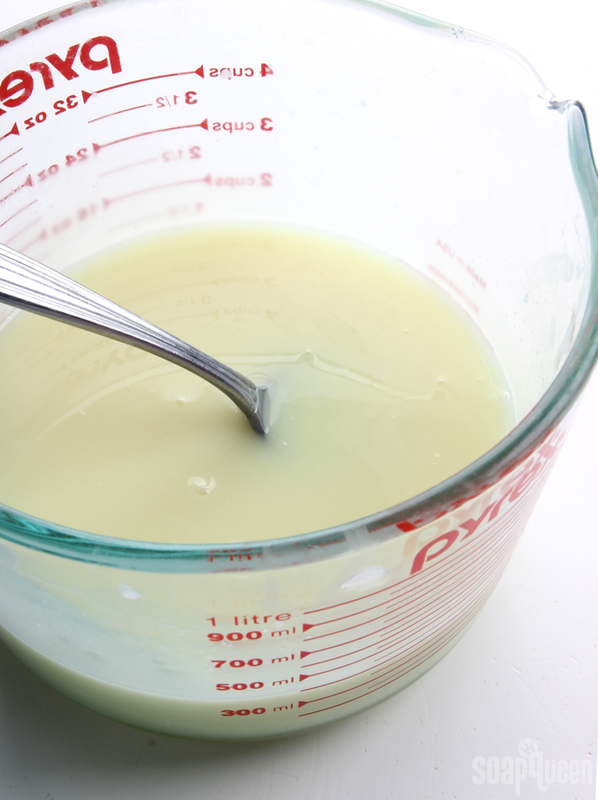 Once the milk has fully melted, continue to stir to make sure all the lye flakes have completely dissolved. Because the temperatures are low, the lye flakes do not dissolve as quickly. Listen and look for lye flakes on the bottom of your container; lye flakes can take a lot longer to dissolve in cooler temperature liquids. Patience is key! Any undissolved lye in your soap could cause skin irritation or even lye burns, so take extra time to make sure all the lye is dissolved. Once all the lye has been added, the milk may become yellow. Below, our milk reached about 90 ° F and developed a very slight yellow color. This color of milk is suitable for this recipe. 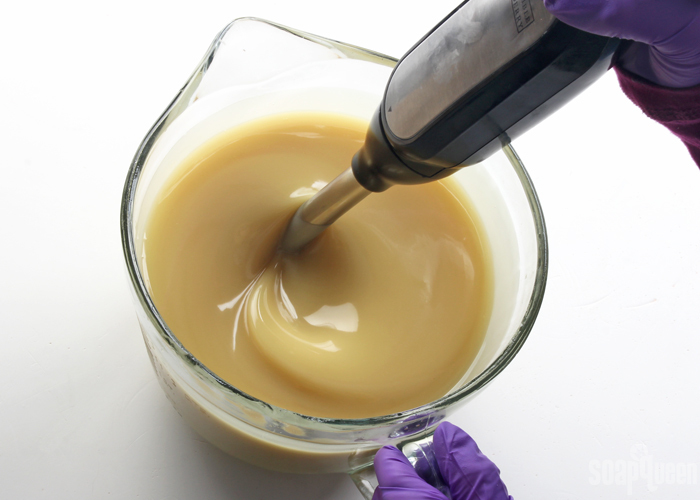 But, if you'd like to make sure your soap batter is as light as possible for your color palette, placing the container of frozen milk into an ice bath helps keep temperatures cooler, as shown in this post. 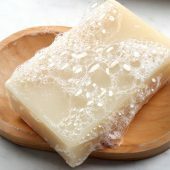 If you’d like a harder bar of soap that releases faster from the mold, you can add sodium lactate to the milk solution. Use 1 teaspoon of sodium lactate per pound of oils in the recipe. For this recipe, you’d add 2 teaspoons sodium lactate. Now that the lye and milk solution is ready, it's time to prep the other ingredients. Fully melt and combine the coconut oil, olive oil pomace, cocoa butter, apricot kernel oil, and palm oil (remember to fully melt then mix your entire container of palm oil before portioning). 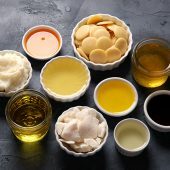 Once the oils have cooled to 130 degrees or below (the milk lye solution will be on the cooler side, that's okay), add the Oatmeal Milk and Honey Fragrance Oil directly to the oils. Usually fragrance oils are added at trace, we know this fragrance behaves so well and thin trace is not a concern, it can be added first. Add the milk and lye solution slowly to the oils. As you add the milk, begin pulsing your stick blender. 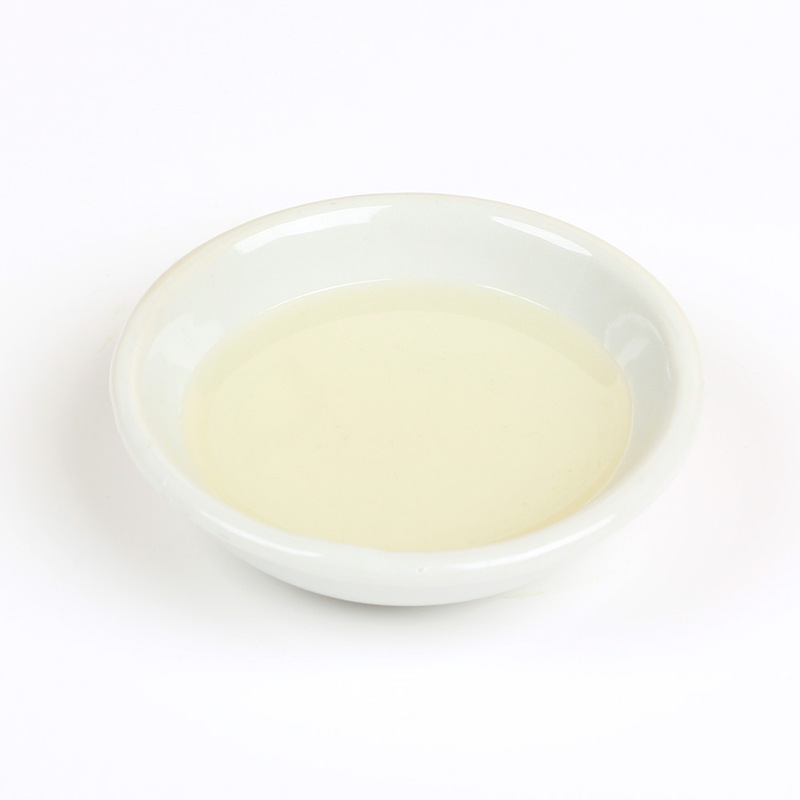 Because the milk and lye solution is on the cooler side and the recipe contains hard oils that solidify at cooler temperatures, adding the lye and milk solution gradually can help prevent false trace. 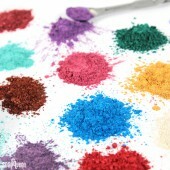 Once all the lye solution has been added, continue to stick blend until you reach thin to medium trace. 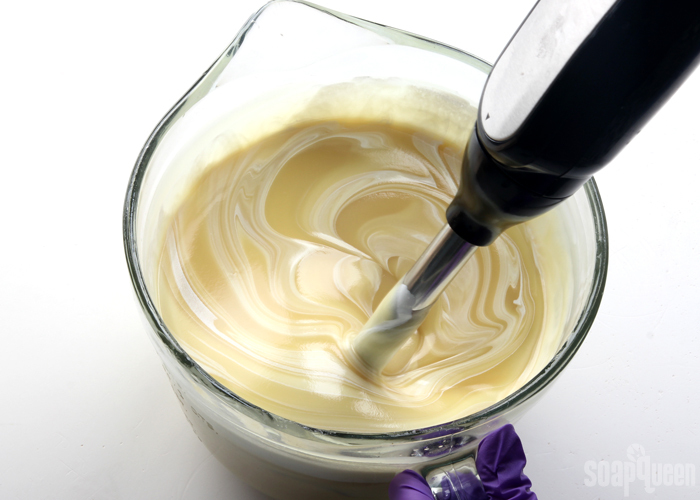 Add all the dispersed titanium dioxide, and use the stick blender to stir and blend the colorant into the batter using short bursts. 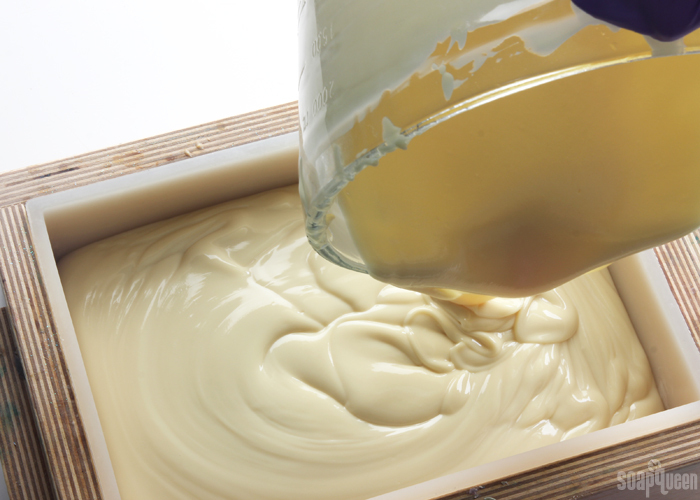 Once the colorant is completely incorporated, pour the soap into the mold. Tap it firmly on the counter to eliminate air bubbles, and use a spoon or spatula to spread the soap evenly into the mold. Using a small stainless steel spoon, create texture on the top of the soap. There is no right or wrong way to do this, so have fun with it! Once you’re happy with the top, insert the dividers into the mold. Push the dividers all the way to the bottom of the mold. 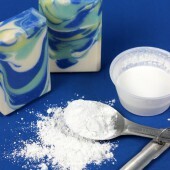 Spray the top of the soap with 99% isopropyl alcohol to help avoid soda ash. 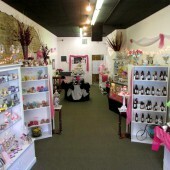 Milk soap has a tendency to heat up due to the sugar in the milk. 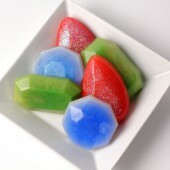 To keep it cool, place the soap in the fridge or freezer for at least 3 hours, up to overnight. Then, allow it to sit in the mold for about 3-4 days. 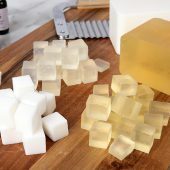 Soap that is placed in the fridge or freezer for the first few hours of saponification can take a little longer to unmold. If you find the silicone liner is not pulling away from the sides of the mold easily, give it another day to unmold. Remove the soap from the dividers (see the unmolding process in this video here) and allow the bars to cure for 4-6 weeks. Enjoy! 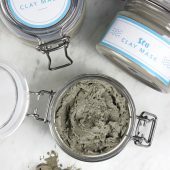 I would like to add some castor oil to this recipe for lather – how much would you recommend, and would this mean reducing the other oils, or just adding it in. 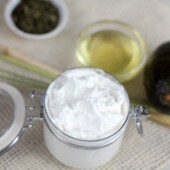 We recommend adding Castor Oil 3-5% of your recipe for a creamy lather. You can reduce your other oils by that percent. You will want to run your recipe through the Lye Calculator with the new oil amounts to get your adjusted lye / water mounts. Hi, Newbie here! Wondering if you could offer some advice. 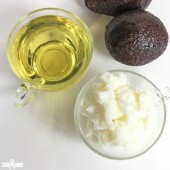 I’m hoping to make this recipe but would I be able to substitute the Lots of Lather mix in for the oils? 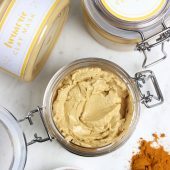 I’ve been trying to find a super soothing goats milk, oatmeal, and honey recipe for my daughter who suffers from eczema. Hoping I can find a way to modify this one a bit so it will work. Thanks for your help!! 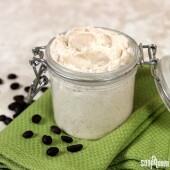 You can definitely modify this recipe and use the Lots of Lather Quick Mix. Just make sure to run the amount of quick mix you’re using through the Lye Calculator to make sure your Lye and Liquid (goat milk) amounts don’t change too much. Wanted to use this recipe substituted with coconut milk when I’m out of goats milk. Would you suggest freezing the coconut milk like the goats milk? Or using distilled water for half the liquid amount and making a lye solution with that Then mixing the other have of the liquid using coconut milk in after adding the oils.? I would recommend freezing the Coconut Milk before adding your Lye to it like you would the goats milk. 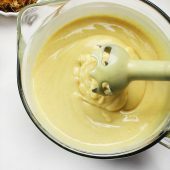 Some people also will add the milk in at trace though normally that is when you are using the powder and use just add enough distilled water to help blend it into the soap batter. You wouldn’t normally add as much as half of your liquid at that point. Was wondering if the fragrance in the recipe is by weight or liquid volume. By weight. 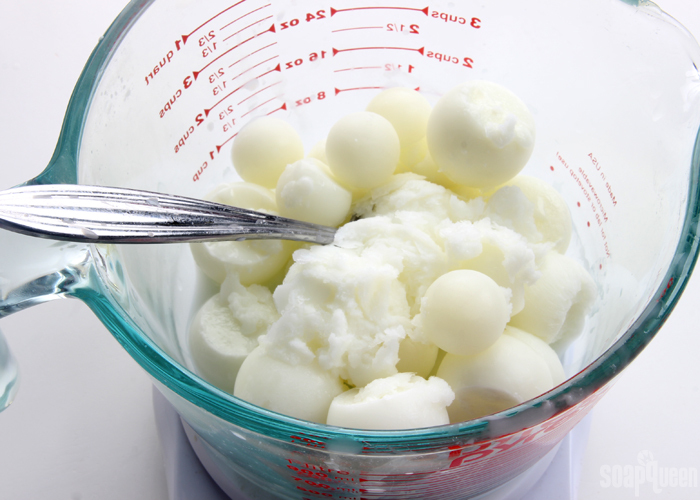 We recommend measuring almost all recipes, especially cold process soap, by weight for the most consistent results. I made this soap with powdered goats milk reconstituted to 11.6 Oz and added 2 tsp of sodium lactate. Everything else was per recipe. Oil was 123 and lye was 87 when I mixed it. It looked great but when I pulled it out of the freezer there was a gel circle throughout. I was ok with it but when I cut it, some of the layers crumbled. The pH looks ok on litmus. And it has zero lather. I’d like to try again but I would rather know if I can prevent the crumbling?. And is the lack of lather normal? Thank you. 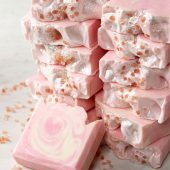 I’ve just started soaping and have made about a dozen of your recipes. 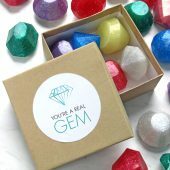 I really appreciate your site and products. This is only my second problem child and ironically the other problem was crumbling too. Did the crumbling happen immediately after removing from the freezer? If so that would be the reason why. We recommend waiting at least two days before cutting your soap after you had it in the freezer. Lather increases the longer the soap cures. 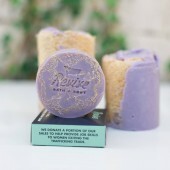 I would wait at least a week into the cure before attempting to check the lather of the bars. 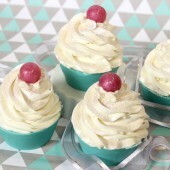 Does the titanium dioxide reduce lather in this recipe? I’ve heard that it does. 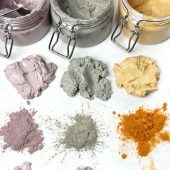 Greatly overusing a colorant can negatively impact lather, but we didn’t notice any reduction in lather with this recipe. I was given some goat milk, already frozen in cubes. I saw somewhere that you should weigh out liquid milk and then freeze exactly what you need in cubes. Would it be necessary, then, for me to thaw and weigh liquid milk and refreeze it? Or could I just weigh out the frozen milk? Seems like thawing and refreezing might break down some of the good qualities of the milk. You can weigh the milk frozen and try to chip it away to get to the amount you need if they are larger cubes. 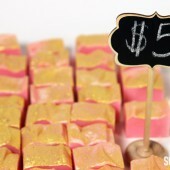 I recently made a batch of soap following this recipe. I followed the directions exactly except I used black amber and lavender fragrance oil instead. I left the soap I the mold for 3 days, then took it out. It was beautiful. However, the more time it’s sat out, the darker it’s becoming in color. It’s almost brown at this point? What did I do wrong? To stop this from happening you would want to use a fragrance oil that does not discolor in cold process soap. So, I have recently figured out that I am allergic to coconut and most of its derivatives. I don’t think that palm oil is a safe bet either. I was looking for a soap I can use. This looks good, but do you have any suggestions to replace the coconut oil? And if so, how much percent should it be, as I know some oils are thicker. 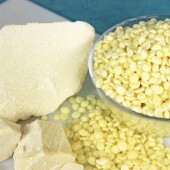 Palm Kernel Oil, Lard, and Babassu Oil all make suitable substitutes for coconut. 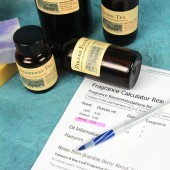 Once you make the swap, use our lye calculator to get your new water/lye amounts: https://www.brambleberry.com/Pages/Lye-Calculator.aspx You should be able to use them at the same rates/ratios as the original recipe called for in coconut oil. 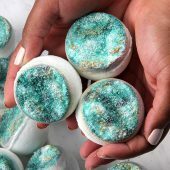 Hi, I love you websites & tutorials and have learned tons about making soap. 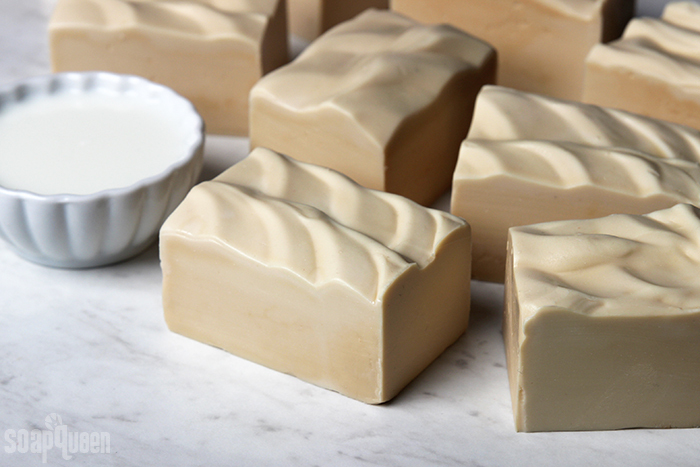 I’ve made this Creamy Goat Milk Soap about 8 times and really like it’s properties. I’d just like it to be slightly harder overall. I do add the sodium lactate, but beside that, what would you recommend changing? Also, is the 11.6 oz of goat milk, in fluid ounces or by weight ounces. I’ve seen in one of your tutorials that goat milk should be measured in fluid ounces, but it doesn’t specify which is called for in this recipe. Thanks! You can do a water discount to help harden the bars as well. I would start with 10% discount and that should help a bit. In the recipe we go by weight and not fluid ounces. 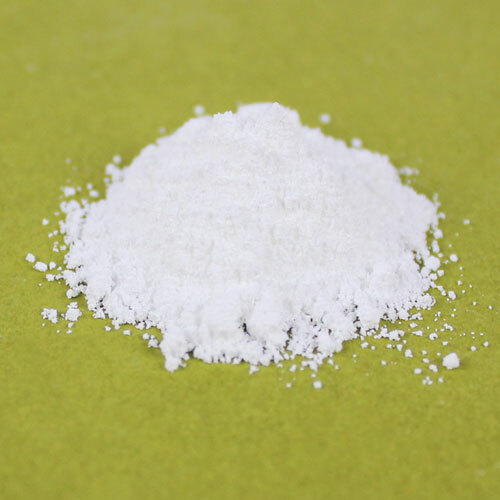 I would like to use kaolin clay instead of titanium dioxide for the white color. How will this affect my soap? Great recipe! I’ve been Soaping for about 2 years making liquid soaps. This was my 3rd bar soap recipe I’ve made. It went very well with no issues and no burnt goat milk! Looking forward to making my next goats milk soap soon. Question: Can lactic acid be used in place of sodium lactate? We don’t recommend using lactic acid instead of sodium lactate. If you don’t have sodium lactate, you can use a salt solution. To make the solution, mix 1 teaspoon of regular table salt into 1 ounce (by weight) of warm distilled water. Stir until the salt is fully dissolved. 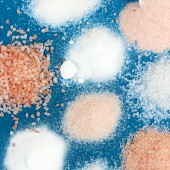 We recommend 1 teaspoon of salt in 1 ounce of water per pound of soap. 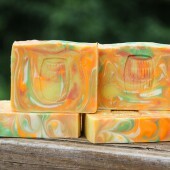 Here is a palm oil question based on your directions: I have used palm oil in a few batches of my beginner soap. I didn’t know anything about melting the whole container first & would like to know what is the reason for that? I don’t know if it made a difference in my soaps. I have certified sustainably grown palm oil which comes in a small container; how would I melt that? Palm oil is composed of various fatty acids, one of which is stearic acid. The stearic tends to sink and solidify first as the liquid oil cools. This means the stearic acid is unevenly distributed throughout the palm oil container and can do some weird things in soap, like create solid specks in the bars. If your palm oil is in a container, you can scoop it into a heat-safe container, melt, and mix thoroughly before adding it to your recipe. Excited to try this recipe! 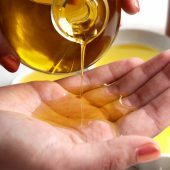 Can you recommend a substitute for palm oil? My goats milk soap is suddenly all getting soda ash, I soap in a shed and I have had no issues before, but suddenly every batch is getting soda ash. I make the lye and milk solution first, before melting the oils, so the lye is much cooler when it gets added to the oils, I then bring it to a light trace and pour into molds which are then placed in to the freezer for 48hr, after tens min in the freezer I spray with alcohol spray. 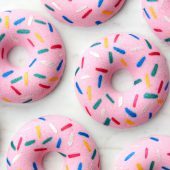 The bars come out of their molds fine and then suddenly they are covered in soda ash, can you see what I am doing wrong? I have a dehumidifier in the shed. We’ve noticed we get more soda ash in the winter when it’s colder, so that may be the reason you’re getting more now. It’s also common with milk soap that has to be kept at lower temperatures. Is it the scent that discolors in this recipe or the goat milk? It’s mostly the scent that discolors this recipe. When you freeze milk and keep it cold during the process, it helps prevent a lot of discoloration. If I were to not reconstitute the goats milk powder and add it in in powder form at trace, how much should I use ppo? 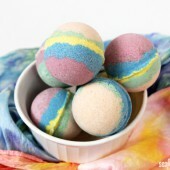 You can start with about 1 teaspoon per pound of soap and add more from there if you like. Make sure to keep the soap in the fridge or freezer afterward to keep it cool. i will prepare a home made goat milk soap .so how to percentage add to goat milk for 100g soap. Add your oil amounts and then click “Calculate.” The “liquid” portion is how much goat milk you want to add. Can honey be added to this and if so when and how much? Thanks! You can add honey to this recipe. But, it’s important to keep in mind that honey will cause the soap to heat up due to the sugar content. This can be undesirable when making milk soap, as the soap can scorch if it becomes too hot. In general, use about 1 teaspoon of honey per pound of soap. You can certainly use more, but keep in mind the more honey you use, the hotter your soap will get. 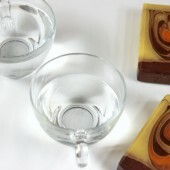 Some soapers add their honey to the soap directly during trace. 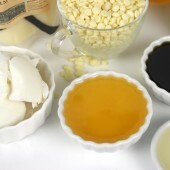 Others prefer to dilute the honey in a portion of the water in their recipe, and add this mixture at trace. Can colloidal oatmeal be added to this recipe and if so when and how much. Thanks! You could add colloidal oatmeal if you’d like. 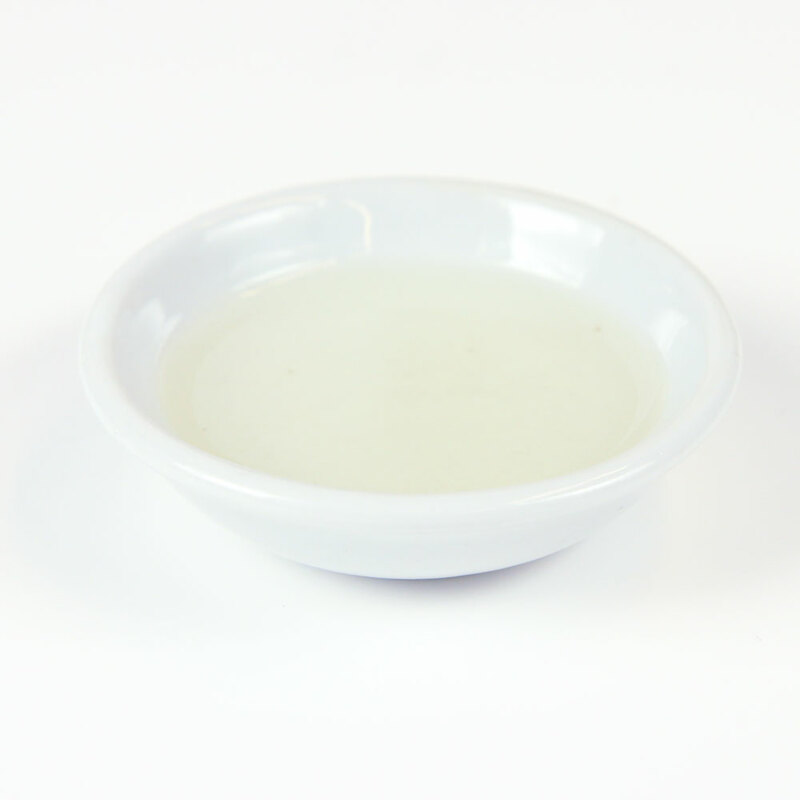 Colloidal oatmeal can be dispersed in a lightweight liquid oil and added at trace. 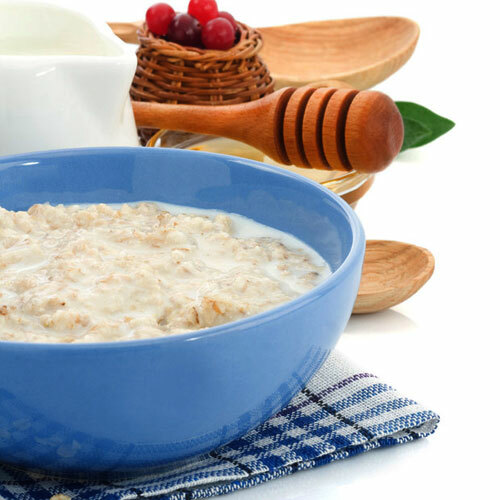 We recommend 1 tablespoon of oil for every teaspoon of colloidal oatmeal. 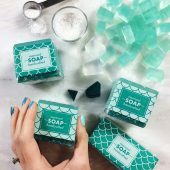 A good place to start is 1 teaspoon per pound of soap, but can be adjusted depending on preference. I used cold pasturized goat milk from the supermarket and when I added the lye, it formed a layer of what looked like coagulated milk and was a very dark orange liquid underneath. Could it be due to additives in the milk? Or was the temperature too high and “cooked” the milk? I diluted it and poured it down the drain as I didn’t know what was happening. It sounds like the lye may have reacted with some of the fat in the milk. That can happen. Was the milk frozen when you added the lye? No the milk wasn’t frozen. I had it frozen in a block (forgot to use the ice cube trays!) then left it on the counter to melt a little so I could measure out the required amount. I think that will help for next time. When the milk is frozen, there’s less of a chance of the lye reacting. To keep it really cold you can also place the lye container in an ice bath. 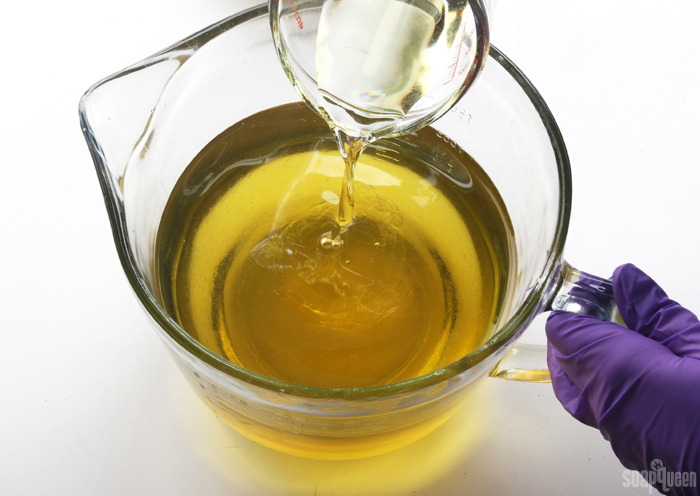 Once the lye is fully dissolved, you can get started on your soap. When will the Cocoa Butter cubes be back in stock? I have never seen this item out of stock before and I am out……. We no longer have the cocoa butter cubes, but we do have cocoa butter wafers. 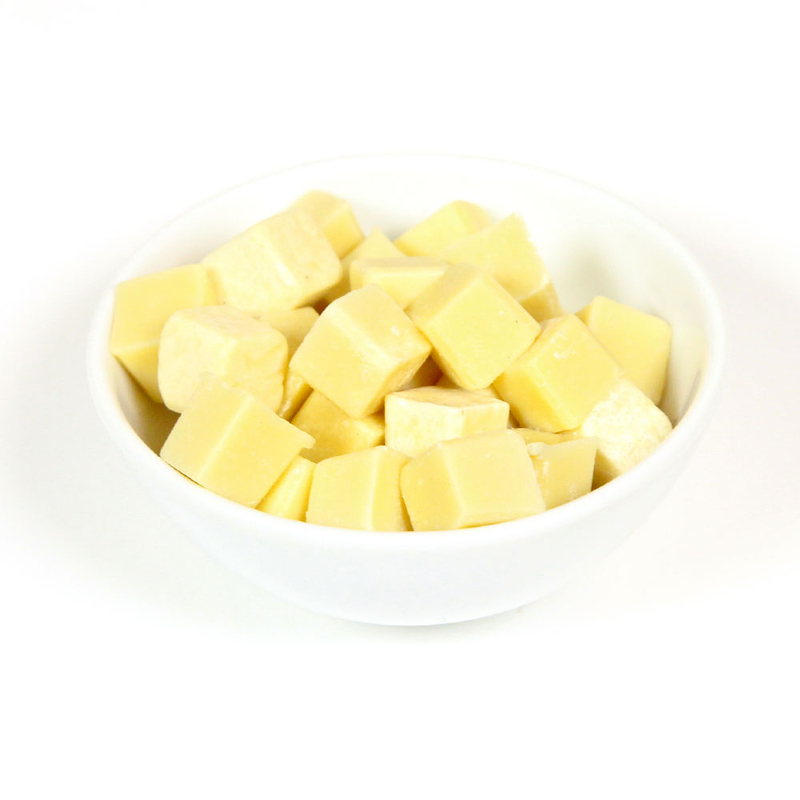 They’re easy to measure and melt: https://www.brambleberry.com/Organic-Cocoa-Butter-Cubes-P6365.aspx? Yes, you can use olive oil pure in place of the pomace. They have a similar feeling in the soap, the main difference is pomace accelerates slightly while pure doesn’t. 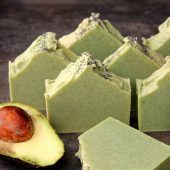 Hello, I’m fairly new to cold process soap making, but very excited to try this recipe. I’d like to use essential oil in place of the fragrance oil as I’m looking to make a soap with a sandalwood scent. It appears I would need quite a bit of oil for this recipe and sandalwood seems to be incredibly expensive. Do you have any suggestions of possibly another EO that resembles sandalwood that is more cost effective? It has similar earthy and woody qualities to the sandalwood. It’s also nice and strong, so a little bit goes a long way. Seems like a silly question, but does this recipe still work if I double it? I’d rather buy the 18-bar mold than the 9-bar. hi.. that’s a fab recipe. I want to know one thing, is it okay to discount the water completely with milk? because i have seen some people use half water and half milk.. please reply..
You can use all milk for this recipe, all distilled water, or a mixture of both. All those methods work well. If you’re using any milk, you’ll want to keep it cool using the method shown above. I printed a test page and it looks OK on my end. You may want to contact your printer manufacturer to see if they can help. It isn’t the printer but I was curious if it shows up black/gray when other hit the print button. Everything else prints. The background is gray, but you should still be able to see the text in the print preview. Are you seeing that? What is the lye concentration and SF so I call run out through a soap calc. I was trying to read through the comments but couldn’t find answer to my question. I apologize if it’s repetitive. If I don’t have apricot kernel oil in hand, what will be a good substitute? 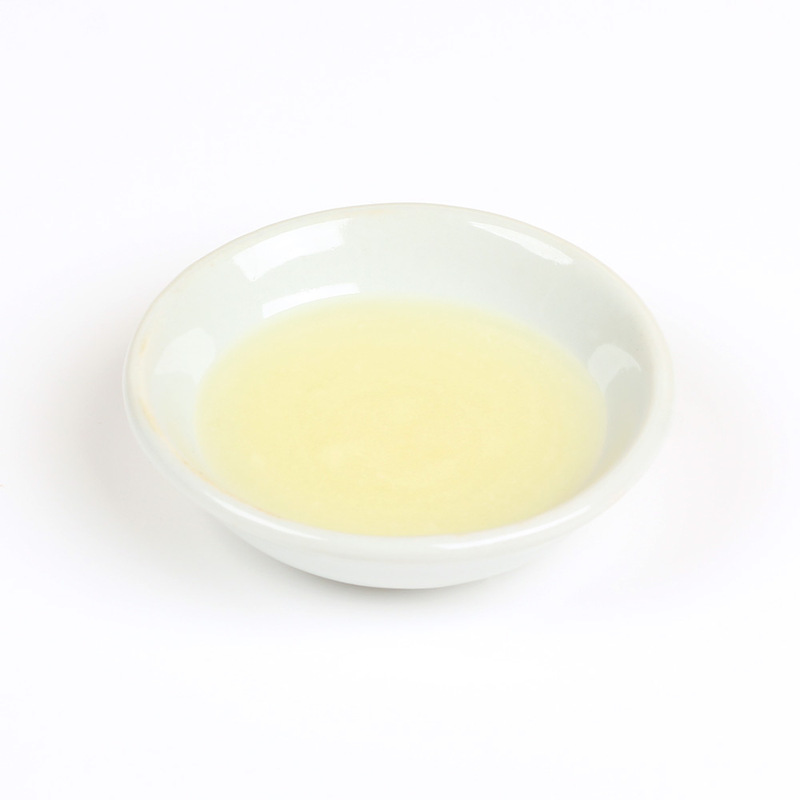 Sweet almond and hazelnut oil have a similar consistency, so they work well as substitutes. 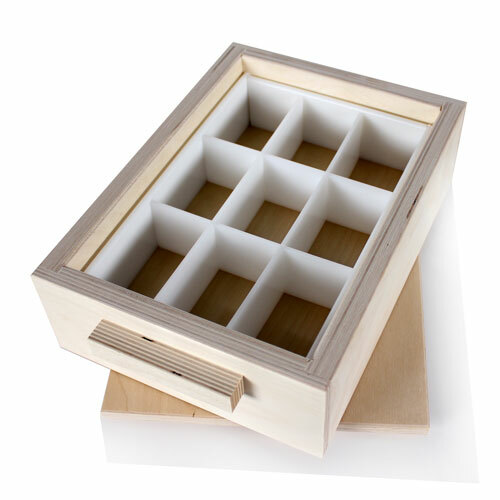 If I can’t spring for the large divided birch mold what other molds or trays will work? I would like to add some oatmeal to this recipe. What do I need to know to be successful? Do you want to add oats, or colloidal oatmeal? 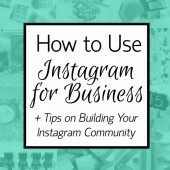 Let me know and I can give you some tips. I had written up a comment but don’t see it posted….so I’m Asking again, please bear with me. Firstly thank you so much for all your help and patience with our questions. Your comments/answers actually are lessons by themselves in this terrific journey of soaping! So yesterday i made gorgeous camel milk soap cold process (i made a mistake and typed goat’s milk in my last question) and it remained a lovely off white colour. However, i think it may have been a false trace and my lye and oils haven’t saponified! The oils and butters were liquid at around 77 degrees F and the lye mix was around 56 degrees F (or it could be the other way around lol i cant remember a bit here). Were the oils too cold? I have no idea how to tell if they are soap or not. they are in the fridge and hardened up and feel like lotion bars when i touch them. How can i tell if they have saponified? I would hate to ruin the gorgeous colour i was able to achieve by hot processing it. God bless you for your help and your constant supervision of us kiddies here. Do you notice any pockets of liquid in the soap, or do you see liquid pooling on top? Does the soap have an even appearance, or do you notice any spots in it? I have been using hot process (semi frozen milk and then getting the oil mixture and milk/lye mixture to 95 degrees before mixing). Could I use this same recipe with hot process? If I did what else would be different? Hot processing milk soap can be tricky. Because it needs to be heated for a long period of time, the milk will scorch. 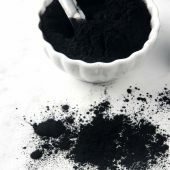 That causes discoloration and an unpleasant smell (that goes away with curing). You can add the milk at the end, but because the soap is mostly done saponifying the milk may not fully turn into soap. This soap is superfatted at 5% and it doesn’t have a water discount. You can adjust the superfat or add a water discount if you like. A water discount will help the soap unmold and cure more quickly. 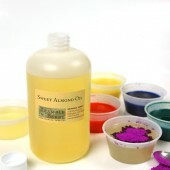 In place of apricot kernel oil, you can use sweet almond or hazelnut. Just make sure to run your recipe through the Lye Calculator after any substitutions. I have a coconut allergy. What can I use as a substitute? Thank you in advance! Can i use this soap on my beard? What i mean by that is, is it moisturising while not stripping away too much of natural oils? Btw, i have made a goat milk soap, but a little bit different recipe. Made it yesterday, and now 24h later, its firm, looks creamy, feels creemy, but, when i was my hands with a sample, it dries out my skin.. Is it because it’s just 24h after the pouring, or is it something else? I’m not sure why that’s happening, the ingredients should help moisturize the skin. You may give it a couple days and try again. During the first two days the lye is still chemically reacting with the oils, so there may be some active lye. You can try the bars again after 5 days or so. Also, you’ll want to handle the bars with gloves for those first few days just to be extra careful. I recently bought a shrink wrap machine for my soaps and the person that sold it mentioned that goat milk soap soap should be wrapped in the non perforated wrap. 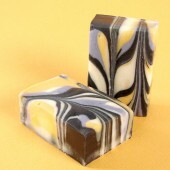 I’m wrapping my soap because I like the look but am wondering if goat milk soap should be wrapped to prevent spoilage or rancidity? 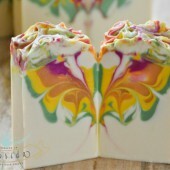 I cannot wait to get more soap making experience under my belt so I can try this one out! 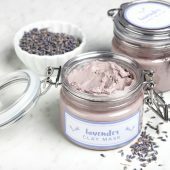 Two modifications I keep thinking about: replacing the oatmeal milk with lavender (infusion? 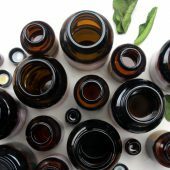 essential oil? additional coloring? combination of above?) and replacing with a “masculine” essential oil (cedar blend? DIY Old Spice blend?) I’m toying with the idea of using this as wedding favors, but first more research! 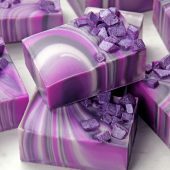 Still working on a masculine fragrance blend, but I’m also toying with the idea of modifying the colors and fragrance to the Bramble Beer Soap recipe for the men’s favors. Which leads to the next issue, I have several people that are severely allergic to nuts. I’d have to check, but I’m pretty sure that coconut, cocoa, and palm are on the allergy list. Any suggestions on how to deal with this? I swear I refreshed the page, but it didn’t show your follow-up Kelsey. Thanks a bunch, I can’t wait to try that blend you suggested! I swear this is my last comment for a while before I start the practical trial phase, but this blog has been such a help in my research phase! I checked in with Cousin Allergies (she has a bunch), and she said the following recipe base was safe for her. What do you think of the recipe? I am concerned about it being soft, so I am considering adding sodium lactate to it (at 1 tsp per lb). I’d like to do a trial run with just distilled water, lye, and vitamin E (at 1 tsp per 1b) to see how it behaves before I add the fun stuff: sugar, fragrances, colorants, and changing the water source (goats milk and beer). Also, regarding the article on superfatting soap. (BTW, half the articles here won’t let me comment, my engagement level with this site must be at play!) 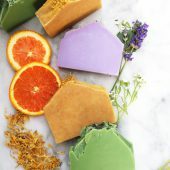 If I want the superfat to be a specific oil (for example, the apricot kernel oil), is it possible, and if so, how would I go about doing this for a CP soap? Perhaps by using it as the carrier oil for the fragrance and colorant and incorporating at trace? Again, thanks for all the help. I see how hard y’all are working! For the superfat, you can take the amount of lye that you are supposed to use and multiply it with the following equation (1 – % superfat you want). 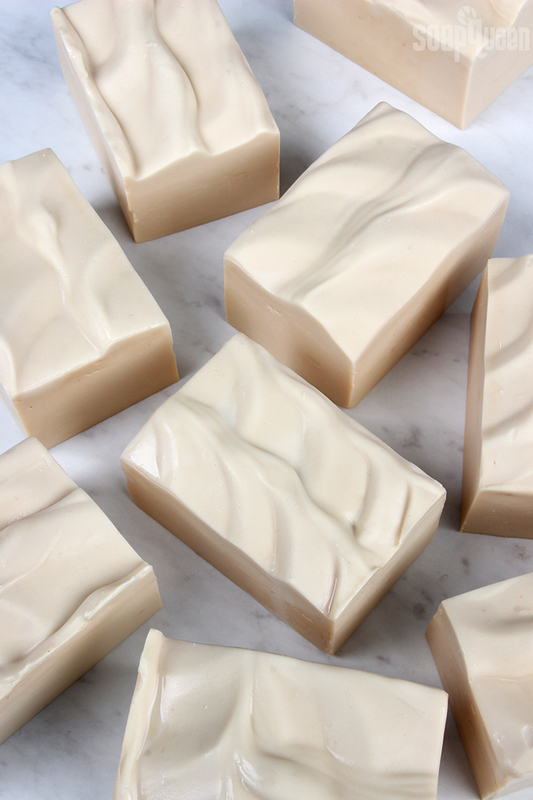 So, if you wanted to superfat an olive oil soap by 4%, you would do the following (1.34 oz. lye) x (1 – .04) = 1.286 oz. lye. 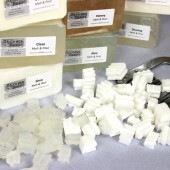 Or you can do the rough ‘n’ easy way; for a one pound batch of soap, a 5% superfat works out roughly to .8 oz. of extra oils per pound of soap. I’d like to know shelf life of soap with milk. Newbie soaper here. 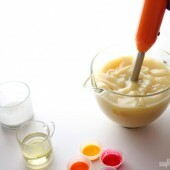 I just unmolded this recipe from a silicone loaf mold and found it had gone thru partial gel. I used a cold mold out of the freezer and froze it for 24 hours after pouring. Should it be left in the freezer longer? I did pour some in bar molds and they look great. Would using the 9 bar mold vs the loaf mold help with the partial gel? 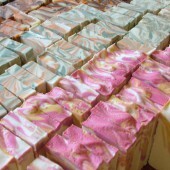 Otherwise the soap looks wonderful, creamy and light. Freezing it for 24 hours is plenty of time. What temperatures were your lye and oils, and were you using a wood mold? 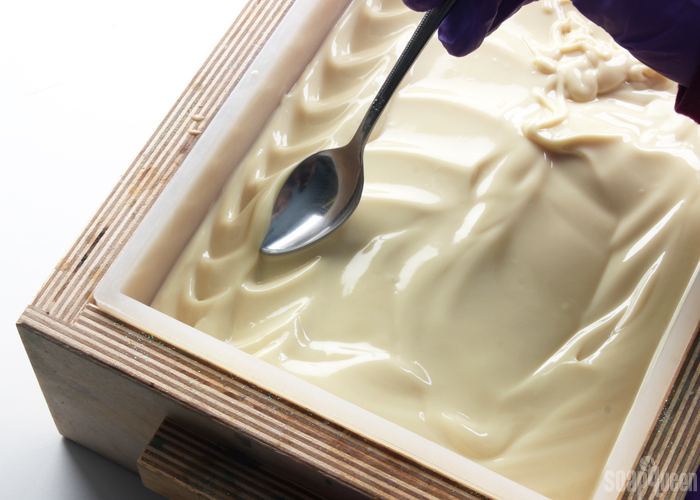 Wood molds insulate more than silicone so the soap does get warmer. Thank you so much for your kind reply. 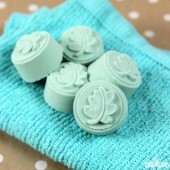 Your blog has been so helpful as I I have become addicted to soaping. If I remember correctly my oils were at 134 and my lye/milk was at 88 (I had it on ice). Maybe I should have let the oils cool more? Those temperatures should work just fine, your next batch you can have your oils around 120F and the lye around 80F just to be careful. 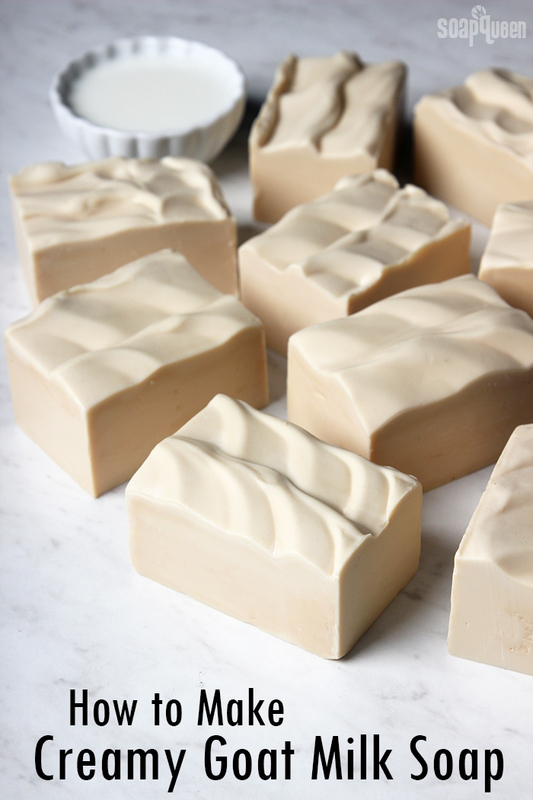 Was your soap in a wood mold? Thanks for your reply. I used a silicone loaf mold, no wood. I am waiting on another batch of milk but I will try those cooler temps and see if I can avoid that partial gel next time around. Sounds good, let us know if that helps. Hi. I love this recipe. Followed it and my bars came out wonderful. 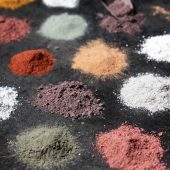 I am wondering though if it wouldn’t be easier to just mix the lye with water, and then add the goats milk powder at trace? Wouldn’t that be easier? What are the pros and cons of doing it this way? I have only been making cp soap for several months now. I have seen several people do goats milk this way and it seems like they are not having to worry about temp,etc. what do you think? Another question please… every time I soap at lower temperatures,even dropping down to 120-110 my soap is always crumbly. With or without soap ash. It just never seems to work for me. I live in Vegas and it is extremely dry here. Maybe I’m impatient and unmolding all my soaps too soon? I don’t know…I’m getting discouraged. You can add the goat milk powder at trace if you like. It has a tendency to clump up, so you’ll want to stick blend it in. You can also mix the goat milk with a bit of water and add that at trace, just make sure to discount that from your main liquid amount so the soap isn’t too wet. Also, make sure to pop it in the freezer for 5-24 hours still, otherwise it can overheat. 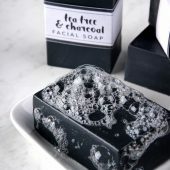 As for the soap texture, how are you storing it? Are you adding sodium lactate? 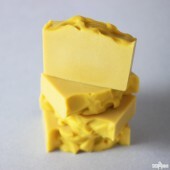 Crumbly soap is usually caused by heat, a lot of butter in the recipe, or a lot of sodium lactate. I am adding sodium lactate and I think I will try decreasing that by half the recommended amount just to see. After cutting the bars I store them inside my home which is not very hot. 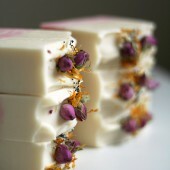 Funny thing is, the soaps that I have made with butters in them don’t crumble like the other ones!! Ugh!!! Will try decreasing the sodium lactate first and see what happens. Thank you for trying to help Kelsey. I’m so bummed-just realized after I made this that I only used 8 oz water and the 1 oz of goat’s milk powder. I forgot to weigh before mixing with the lye. Do I have to throw this whole batch away? Did you add the 4.9 oz. of lye to the 8 oz. of milk? Let me know and I’ll help you troubleshoot. 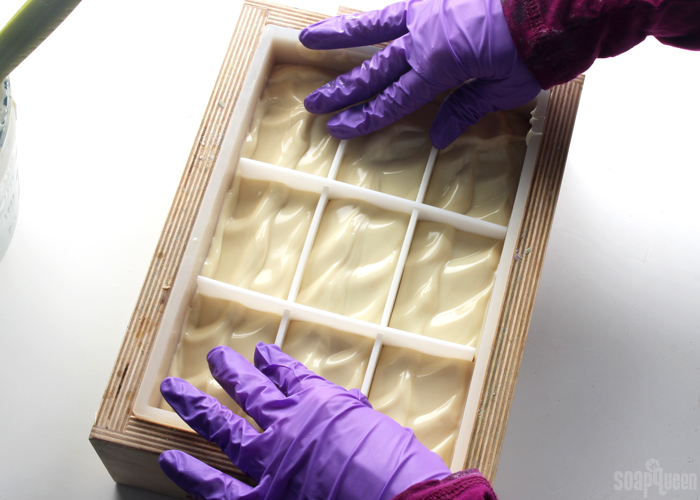 I usually make soaps in the loaf mold however I recently purchased the 9 bar slab mold and liner and I am currently awaiting for them to arrive any day now. With this recipe it looks like its a little over 2lbs of oils (35.1oz). Approximately how many ounces do the finished bars weigh? Thanks. 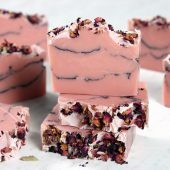 I’m fairly new to soap making, and this may be a silly question, but would it be possible to make this without the fragrance oil? Would I need to reformulate the recipe? I make a goatmilk soap with 25 % Palm and Almond oil, 20% coconut and olive oil and with a little castor oil and shea butter for lather and moisture, superfatted at 5% with a 10% water discount…It lathers extremely well and feels soft and smooth on the skin during the shower, but it seems like my skin feels dry/tight afterwards, as it does with most soap. 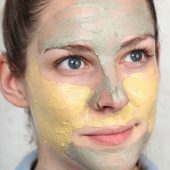 Is this a function of my skin type or is there a particular oil causing this dryness? Most of my soaps have around 20% of both palm and coconut oil with the same 5% superfat and 10% water discount and I’m wondering if either of those are the culprit? Can I make this in a hot process soap? Thanks I am going to try it with the powder after the cook. I make hot process goats milk soap all the time. I use 50% of my liquids as milk and the other distilled water. 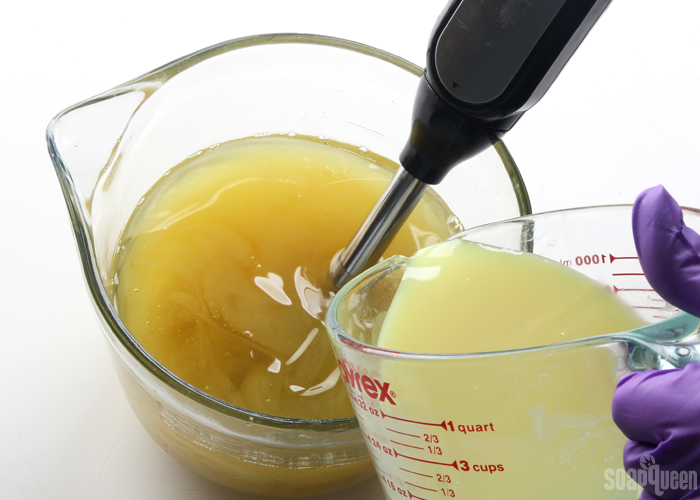 To make the lye liquid solution, I use cold distilled water and add my sodium lactate and a little sugar. After that is mixed, I slowly add my lye and stir until fully dissolved. I have a fan blowing on the bowl and stir off and on until the water temperature drops to 100 to 105*. I wide in the milk fully and then add to my oils. I stick blend until medium trace and put the lid on my crock pot. I keep the temperature in the 140’s to 150 range by switching the crock pot to warm. Leave the lid on the crock pot until it fully gels and then stir real well. Lid back on for 15 minutes and add your FO / EO and whatever you’re doing with color and put into the mold. After soap I’d in the mold, in the frig overnight and cut in the morning. This gas worked very well for me. Hope this helps you. great article! I have yet to make all milk soap. Question, do you get the same qualities using whole cows milk as the goats milk? I am a dairy farmer, and make cows’ milk soap almost exclusively, but am still in the testing phase before pursuing a more serious business approach. I do sell some bars from time to time, but give away more than I sell for others to test. I have made a few batches with goats’ milk. I used to have a couple of goats, but wasn’t actively making soap at the time. They were just other dairy animals to have around. I do know of a couple of people who have goats, so I do have access to the milk. 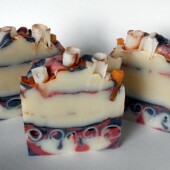 From my experience, the soap behaves very similar while it is being made. Frozen goat milk will soften up a lot quicker than frozen cow milk, and the cream doesn’t readily separate if you freeze it for future use. I have been trying to find additional information on the key differences between the two milks, and based on what I found, they are SIMILAR, but goat milk does have some extra properties that are beneficial to skin. Maybe someone else will know the exact differences. I’d like to know myself. I’m still collecting soap samples to send to you (and whoever else that wants to try them) so that you can tell me what you think of the cows’ milk being in a bar of soap. Some of them haven’t cured enough, that’s why there has been a delay. Another thing I did notice, the goat milk bars had a different ‘look’ to them as well. I don’t know how to explain it. I don’t have any more around that I can send, but I would think comparing mine to your goat milk bars won’t be too big of a difference. It’s almost as though you can ‘see’ the textural differences in them, if that makes sense to you. If there is anybody familiar with making goat cheese, that should give enough of a hint. 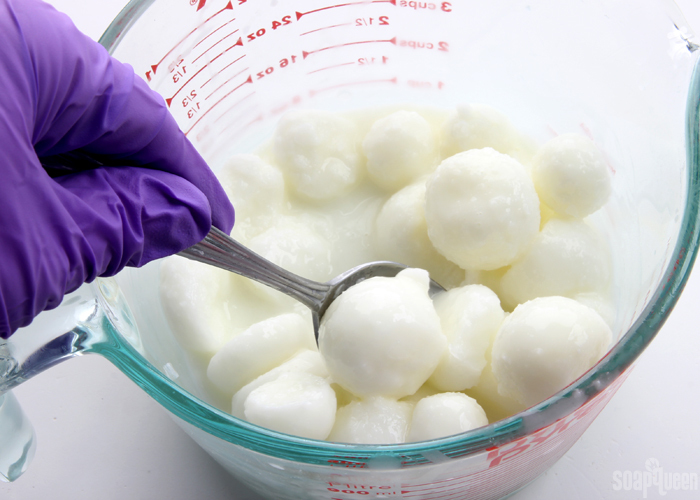 The curd is much softer, and more delicate, and needs to be handled with care. Artisan cheesemakers buy milk from me, and they will use identical cultures in the cow, and goat milk (they have their own goats). The finished product isn’t even close. I’ve sampled quite a bit of their cheeses, and have also spent a little bit of time working in their creamery. No matter what, there is still a reaction between the milk, and the rest of the ingredients. Each one has its own uniqueness. I have done identical recipes using both milks, but that was a while ago, and since I do small enough batches, they are usually gone before I can compare the two of them. 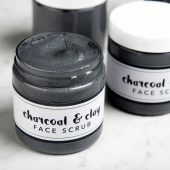 How do I make this using goats milk powder? 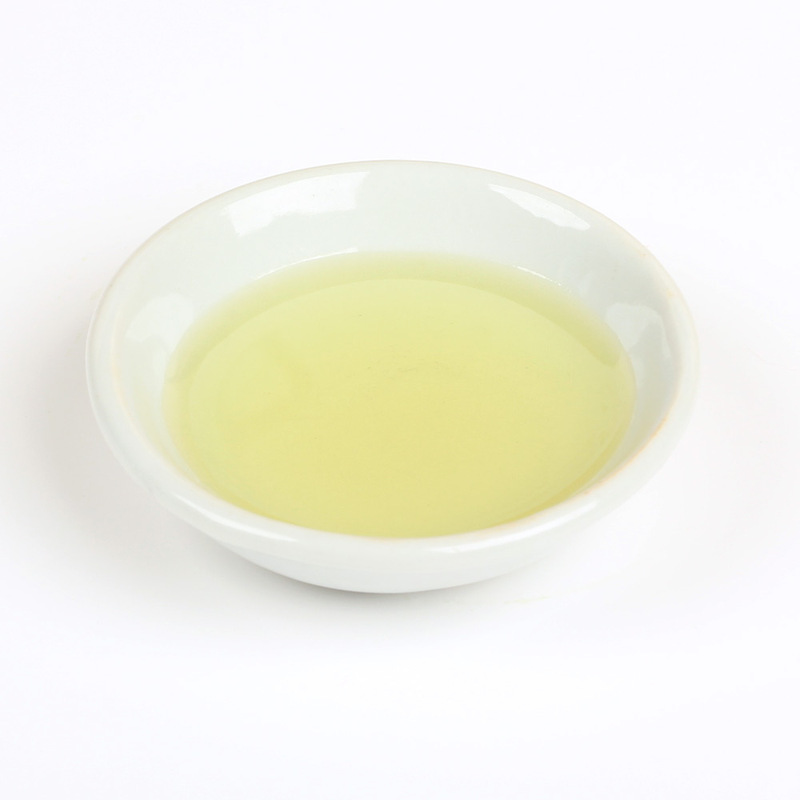 What is the difference between olive oil and olive oil pomace? Are the two interchangeable? I don’t make a lot of soaps with liquids other than distilled water. But when I do I will use about 1/4 of the liquid, or just distilled water depending on what the liquid is, to mix in my lye. When it cools I can add in the rest of my liquid. Much easier than freezing and endlessly stirring down all the lye. I only make soap with goat milk, and my trick (for whatever it’s worth) for making sure all the lye is dissolved is to take the temperature of the lye + milk mixture after all the frozen milk has melted and I think all the lye has dissolved. I stir for awhile and take the temperature, which (for me) is usually between 70 and 85 degrees depending on how big my chunks of frozen milk started out. Then I keep stirring for a few minutes and stop to take the temperature a few more times. If I see the temps continuing to hold steady or go up as I stir, I assume more lye is dissolving and heating up the mixture, so I need to keep stirring! If I see the temps trending down/cooler? At that point, I assume the lye has all dissolved (no longer more lye heating up the milk) and my stirring is cooling the solution. Hope this helps someone! 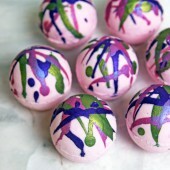 Can we use a different color, or will this mess with the goats milk color. 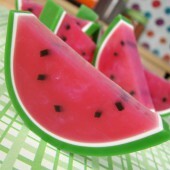 I seriously want to eat that bar of soap. Looks so yummy! btw, I have a question with colorants. Are there any limits on how much you can add? and the result came out really really dark and messy(not what I wanted). So will it be just my dissatisfaction on the way it looks, or will there be any sort of concerns such as skin irritation that I should be aware of?